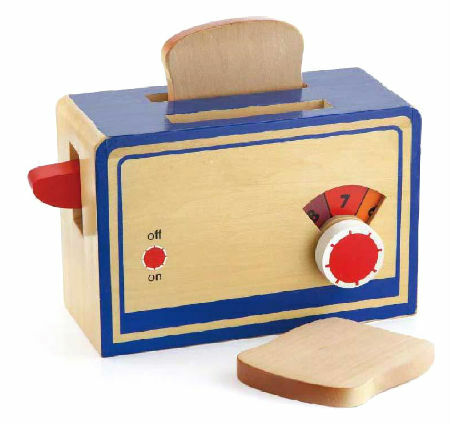 Wooden Toys Pop Up Toaster now your play kitchen can have this fantastic Pop up Toaster. This beautifully made wooden kitchen accessory has a turnable temperature dial so you can pretend to get your toast color just right. The two included pieces of wooden toast are removable and "pop up" when the red lever on the toasters side is pushed down. This is a very solid well made toy and is a great addition to any play kitchen set. We like this because: "You can pop the toast up and catch it."